In a crowded auditorium at New York’s Cold Spring Harbor Laboratory in August, Philipp Messer, a population geneticist at Cornell University, took the stage to discuss a powerful and controversial new application for genetic engineering: gene drives. Gene drives can force a trait through a population, defying the usual rules of inheritance. A specific trait ordinarily has a 50-50 chance of being passed along to the next generation. A gene drive could push that rate to nearly 100 percent. The genetic dominance would then continue in all future generations. You want all the fruit flies in your lab to have light eyes? Engineer a drive for eye color, and soon enough, the fruit flies’ offspring will have light eyes, as will their offspring, and so on for all future generations. Gene drives may work in any species that reproduces sexually, and they have the potential to revolutionize disease control, agriculture, conservation and more. Scientists might be able to stop mosquitoes from spreading malaria, for example, or eradicate an invasive species. The technology represents the first time in history that humans have the ability to engineer the genes of a wild population. As such, it raises intense ethical and practical concerns, not only from critics but from the very scientists who are working with it. Messer’s presentation highlighted a potential snag for plans to engineer wild ecosystems: Nature usually finds a way around our meddling. Pathogens evolve antibiotic resistance; insects and weeds evolve to thwart pesticides. 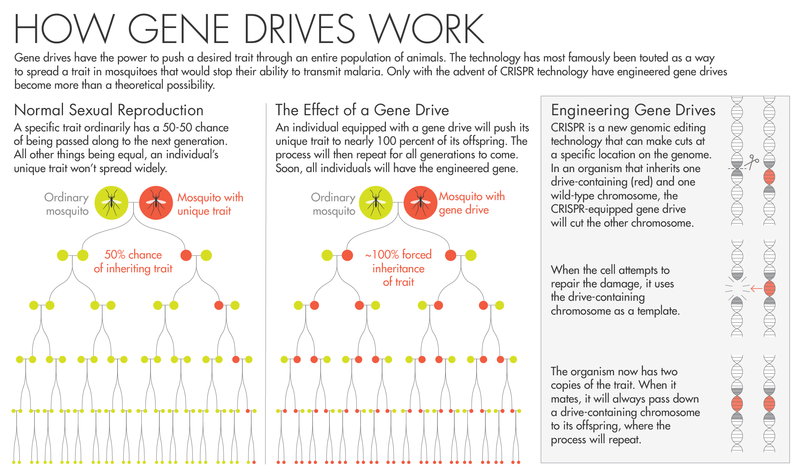 Mosquitoes and invasive species reprogrammed with gene drives can be expected to adapt as well, especially if the gene drive is harmful to the organism — it’ll try to survive by breaking the drive. Gene drives are a young technology, and none have been released into the wild. A handful of laboratory studies show that gene drives work in practice — in fruit flies, mosquitoes and yeast. Most of these experiments have found that the organisms begin to develop evolutionary resistance that should hinder the gene drives. But these proof-of-concept studies follow small populations of organisms. Large populations with more genetic diversity — like the millions of swarms of insects in the wild — pose the most opportunities for resistance to emerge. It’s still unclear where all this interplay between resistance and gene drives will end up. It could be that resistance will render the gene drive impotent. On the one hand, this may mean that releasing the drive was a pointless exercise; on the other hand, some researchers argue, resistance could be an important natural safety feature. Evolution is unpredictable by its very nature, but a handful of biologists are using mathematical models and careful lab experiments to try to understand how this powerful genetic tool will behave when it’s set loose in the wild. In 2003, Austin Burt, an evolutionary geneticist at Imperial College London, proposed a more finely tuned approach called a homing endonuclease gene drive, which would zero in on a specific section of DNA and alter it. Burt mentioned the potential problem of resistance — and suggested some solutions — both in his seminal paper and in subsequent work. But for years, it was difficult to engineer a drive in the lab, because the available technology was cumbersome. With the advent of genetic engineering, Burt’s idea became reality. In 2012, scientists unveiled CRISPR, a gene-editing tool that has been described as a molecular word processor. It has given scientists the power to alter genetic information in every organism they have tried it on. CRISPR locates a specific bit of genetic code and then breaks both strands of the DNA at that site, allowing genes to be deleted, added or replaced. CRISPR provides a relatively easy way to release a gene drive. First, researchers insert a CRISPR-powered gene drive into an organism. When the organism mates, its CRISPR-equipped chromosome cleaves the matching chromosome coming from the other parent. The offspring’s genetic machinery then attempts to sew up this cut. When it does, it copies over the relevant section of DNA from the first parent — the section that contains the CRISPR gene drive. In this way, the gene drive duplicates itself so that it ends up on both chromosomes, and this will occur with nearly every one of the original organism’s offspring. Although there are many different ways gene drives could work in practice, two approaches have garnered the most attention: replacement and suppression. A replacement gene drive alters a specific trait. For example, an anti-malaria gene drive might change a mosquito’s genome so that the insect no longer had the ability to pick up the malaria parasite. In this situation, the new genes would quickly spread through a wild population so that none of the mosquitoes could carry the parasite, effectively stopping the spread of the disease. A suppression gene drive would wipe out an entire population. For example, a gene drive that forced all offspring to be male would make reproduction impossible. But wild populations may resist gene drives in unpredictable ways. “We know from past experiences that mosquitoes, especially the malaria mosquitoes, have such peculiar biology and behavior,” said Flaminia Catteruccia, a molecular entomologist at the Harvard T.H. Chan School of Public Health. “Those mosquitoes are much more resilient than we make them. And engineering them will prove more difficult than we think.” In fact, such unpredictability could likely be found in any species. 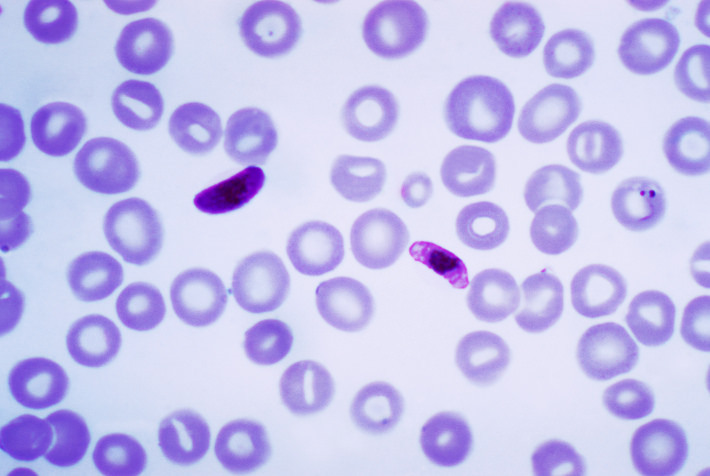 A sample of malaria-infected blood contains two Plasmodium falciparumparasites. The three new biorxiv.org papers use different models to try to understand this unpredictability, at least at its simplest level. The Cornell group used a basic mathematical model to map how evolutionary resistance will emerge in a replacement gene drive. It focuses on how DNA heals itself after CRISPR breaks it (the gene drive pushes a CRISPR construct into each new organism, so it can cut, copy and paste itself again). The DNA repairs itself automatically after a break. Exactly how it does so is determined by chance. One option is called nonhomologous end joining, in which the two ends that were broken get stitched back together in a random way. The result is similar to what you would get if you took a sentence, deleted a phrase, and then replaced it with an arbitrary set of words from the dictionary — you might still have a sentence, but it probably wouldn’t make sense. The second option is homology-directed repair, which uses a genetic template to heal the broken DNA. This is like deleting a phrase from a sentence, but then copying a known phrase as a replacement — one that you know will fit the context. Nonhomologous end joining is a recipe for resistance. Because the CRISPR system is designed to locate a specific stretch of DNA, it won’t recognize a section that has the equivalent of a nonsensical word in the middle. The gene drive won’t get into the DNA, and it won’t get passed on to the next generation. With homology-directed repair, the template could include the gene drive, ensuring that it would carry on. The Cornell model tested both scenarios. “What we found was it really is dependent on two things: the nonhomologous end-joining rate and the population size,” said Robert Unckless, an evolutionary geneticist at the University of Kansas who co-authored the paper as a postdoctoral researcher at Cornell. 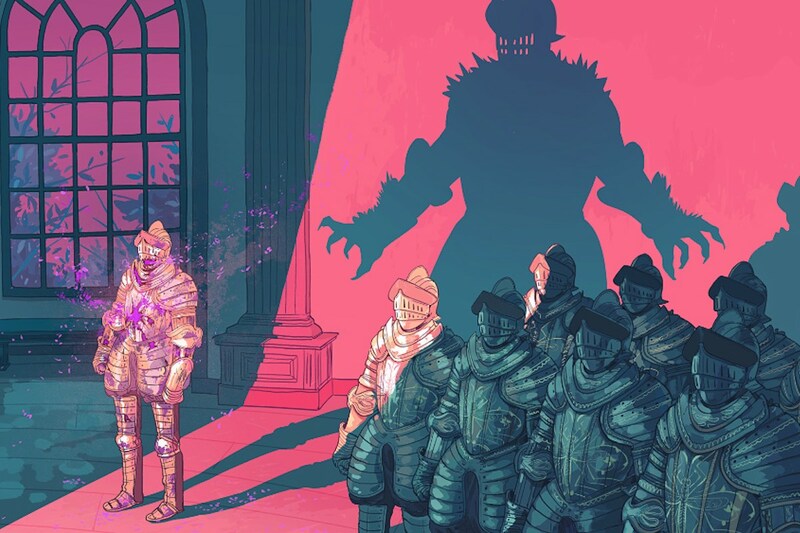 “If you can’t get nonhomologous end joining under control, resistance is inevitable. But resistance could take a while to spread, which means you might be able to achieve whatever goal you want to achieve.” For example, if the goal is to create a bubble of disease-proof mosquitoes around a city, the gene drive might do its job before resistance sets in. The gene drive could also target an essential gene, Noble said — one that the organism can’t afford to lose. The organism may want to kick out the gene drive, but not at the cost of altering a gene that’s essential to life. The third biorxiv.org paper, from the UT Austin team, took a different approach. It looked at how resistance could emerge at the population level through behavior, rather than within the target sequence of DNA. The target population could simply stop breeding with the engineered individuals, for example, thus stopping the gene drive. Resistance is constrained only by the limits of evolutionary creativity. It could emerge from any spot along the target organism’s genome. And it extends to the surrounding environment as well. For example, if a mosquito is engineered to withstand malaria, the parasite itself may grow resistant and mutate into a newly infectious form, Noble said. Not a Bug, but a Feature? If the point of a gene drive is to push a desired trait through a population, then resistance would seem to be a bad thing. If a drive stops working before an entire population of mosquitoes is malaria-proof, for example, then the disease will still spread. But at the Cold Spring Harbor Laboratory meeting, Messer suggested the opposite: “Let’s embrace resistance. It could provide a valuable safety control mechanism.” It’s possible that the drive could move just far enough to stop a disease in a particular region, but then stop before it spread to all of the mosquitoes worldwide, carrying with it an unknowable probability of unforeseen environmental ruin. Messer hopes to put his theoretical work into a real-world setting, at least in the lab. He is currently directing a gene drive experiment at Cornell that tracks multiple cages of around 5,000 fruit flies each — more animals than past studies have used to research gene drive resistance. The gene drive is designed to distribute a fluorescent protein through the population. The proteins will glow red under a special light, a visual cue showing how far the drive gets before resistance weeds it out. Others are also working on resistance experiments: Esvelt and Catteruccia, for example, are working with George Church, a geneticist at Harvard Medical School, to develop a gene drive in mosquitoes that they say will be immune to resistance. They plan to insert multiple drives in the same gene — the strategy suggested by the Harvard/MIT paper. Such experiments will likely guide the next generation of computer models, to help tailor them more precisely to a large wild population. I’m a freelance blogger, writing about health care, art and politics.